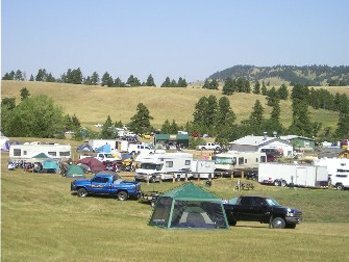 Hog Heaven Campground is conveniently located just one mile west of historic Main Street Sturgis, meaning it’s close enough to walk to the heart of the Sturgis® Motorcycle Rally™, but far enough to escape the noise and congestion. With Sturgis tent camping and Sturgis RV camping, it’s the perfect location for you to enjoy the Sturgis® Motorcycle Rally™. Hog Heaven prides itself on providing the best service during the area’s largest event – the Sturgis® Motorcycle Rally™. We offer the convenience of a small town, with staff dedicated to the highest levels of customer service so you can have a worry-free vacation. Security at the Sturgis® Motorcycle Rally™ takes the worry out of your visit to Hog Heaven Campground. Our professional and friendly security staff understands the unique needs of the motorcycle clientele during the rally and will address all needs and concerns. The front gate at Hog Heaven is staffed 24-hours a day during the Sturgis® Motorcycle Rally™ to provide our guests security and convenience. Guests will receive a wristband, which they will be required to wear when they enter the grounds. 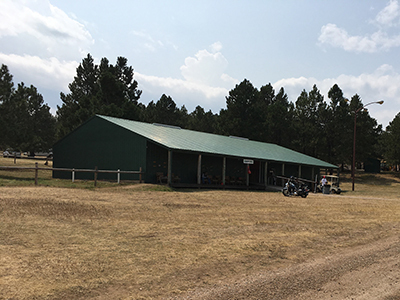 Hog Heaven Campground will accept United Parcel Service (UPS) shipments to its physical address allowing our guests to ship gear and supplies ahead of the Sturgis® Motorcycle Rally™. NOTE: NO United States Postal Service packages are delivered to Hog Heaven, you must ship with UPS. We do not handle FedEx shipments, you must ship with UPS. You can ship to Hog Heaven Campground’s physical address no earlier than Monday, July 30th. Hog Heaven staff won’t be on the grounds prior to Monday, July 30th to accept UPS deliveries. Note, there is a $12 package handling fee to send your box back to your address. 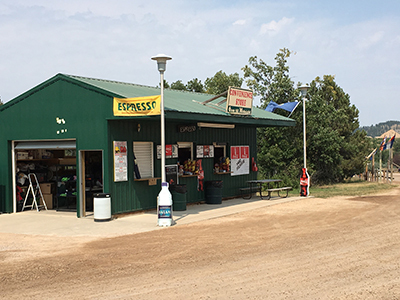 The Hog Heaven convenience store is open 6 a.m. to midnight and has several of the items you need while camping in Sturgis. Ice, beer, cigarettes, t-shirts, food items, newspapers, toiletries, and much more will be available daily. To get your day started right, stop by the convenience store in the morning for coffee and doughnuts. Centrally-located in the campground, our shower houses for men and women have hot water 24 hours a day. Each shower house has electric outlets, flushing facilities, and individual shower stalls. Staff cleans and maintains the shower houses on a daily basis. Friday to Friday during the Sturgis® Motorcycle Rally™, Hog Heaven Campground provides nightly entertainment. Two bars have ice cold beer available daily beginning at 10 a.m. and, for the evening festivities, a viewing deck offers an excellent view of the band stage. The entertainment begins around 8:00 p.m. on the designated nights and bands will be announced in late July of 2018. For your convenience, Hog Heaven Campground offers two on-site restaurants; Freddie’s Hamburgers at Hog Heaven Café and Wagon Wheel Café. Freddie’s Hamburgers is founded by Fred E. Willis of Tulsa, Oklahoma and serves everything from breakfast to dinner. Starting in 1979, Fred has owned and operated restaurants in Oklahoma and has been serving food at the Sturgis® Motorcycle Rally™ for the past 14 rallies before coming to the Hog Heaven Café. Fred loves to see familiar faces from returning Hog Heaven Campground visitors; however, he and his staff look forward to meeting new people each year. Both Freddie’s at Hog Heaven Café and Wagon Wheel Café are open daily at 5:00 a.m. and offer breakfast, lunch, dinner, and snacks until 1:00 a.m.
Beginning in 1999, DaBus has been shuttling Sturgis® Motorcycle Rally™ goers to and from campgrounds and a variety of Sturgis® Motorcycle Rally™ destinations each year. Hog Heaven Campground wants to ensure all guests have access to a safe and sober ride and highly recommend the shuttle service. During the rally, DaBus will deliver your pre-paid wristband to Hog Heaven Campground ahead of time if you’ve indicated that you are staying with us. Once you arrive to Hog Heaven you can pick up your wristband at our Convenience Store. The schedule for DaBus is dependent on traffic and does not keep a set schedule during high-traffic times, but they do try to keep a 30-minute interval between stops to Hog Heaven. While we strongly encourage guests to take advantage of the shuttle service, DaBus is a separate business from Hog Heaven Campground and is not owned by Hog Heaven.